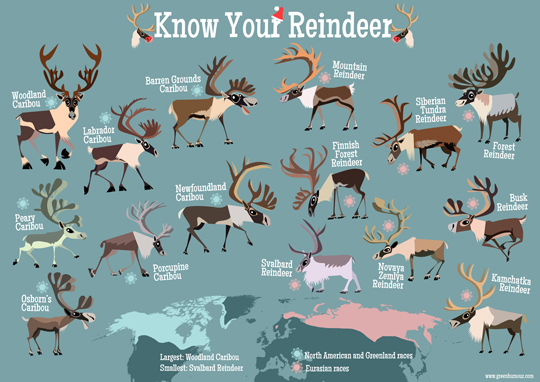 Know your Reindeer this Christmas! I'm not talking about Dasher, Dancer and Prancer! Wild Reindeer (Rangifer tarandus) or Caribou as they are known in North America, occur across the Arctic, sub-Arctic, Tundra and Boreal biomes in North America and Eurasia, as 14-15 different sub-species (that are further divided into various ecotypes) among which, the Woodland Caribou is the largest, and the Svalbard Reindeer the smallest. The Porcupine Caribou (named after the Porcupine River) makes the longest migration for any land mammal on earth! The Finnish Forest Reindeer is one of the rarest subspecies of Reindeer. Prints of the compilation are available as posters and a wide range of merchandise (tshirts, laptop skins, mugs, notebooks, wall clocks and more) on my webstore here.